Outward Hound Bottle Buddies Splashers. The fun never ends with Outward Hound Bottle Buddies Splashers! Some crunch, some squeak, some treat, but Bottle Splashers squirt water! Designed with neoprene fabric for hydrating, outdoor splashtastic fun!! Bound to become one of your best friend’s favourite toy. 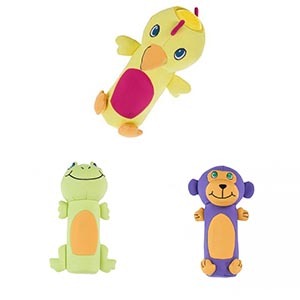 Durably designed, these toys are available in an engaging array of shapes, sounds, and textures so you can have huge fun with your furry friend.